Sightmark, a world wide leader in the development and distribution of night vision and sporting optics, stay true to their one simple mission; to produce high quality optics at affordable prices. Their items are lightweight, compact, and quite durable. Extreme care is taken in the construction and design of each optic, and special attention is paid to the art and physics of optical science. This level of quality control ensures that each device is a joy to hold, use, and look through. Sightmark's 8.5-25x50 Tactical Riflescope features multicoated all-glass lens elements housed in an aluminum 30mm main-tube. This affordable riflescope has been nitrogen purged for water and fog proof performance so your sight picture will remain clear and unobstructed during dynamic weather conditions. The precision adjustments on this Sightmark offer 1/8 MOA corrections via audible and tactile click-stops. The turrets also feature a unique locking system to keep your settings where you put them during intense levels of activity. The reticle is a Mil-Dot type, for calculating distances to a target of a known size, and you can adjust the brightness levels to suit ambient lighting conditions. 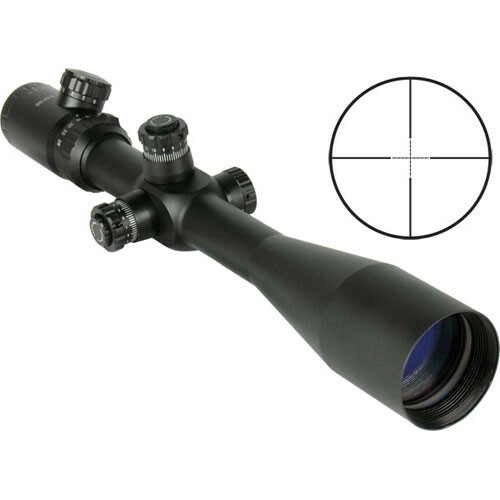 To use a riflescope with your firearm, you'll need a mounting base and mounting rings in addition to the scope itself. Bases attach to your firearm and rings attach to your scope. By affixing the scope mounted rings to the rifle mounted base you create a reliable accurate, and secure sighting system. Proper spacing of the rings, as well as the ring height should be considered to ensure a proper line of sight can be established. This will maximize the value of your investment, and enhance your shooting experience. It should be noted that in many mounting applications, a professional gunsmith's skills will be needed for proper installation. The Mil-Dot reticle assists the shooter in determining the distance to a target of a known size. Accurate bullet drop corrections can be calculated by employing the Mil-Dot ranging system. The illumination feature is user-adjustable with 11 brightness levels. Box Dimensions (LxWxH) 20.0 x 4.1 x 3.4"
8.5-25x50 Tactical Riflescope with Mil Dot Reticle (Matte Black) is rated 4.0 out of 5 by 1. Rated 4 out of 5 by O.Coles from Tremendous value: delivers consistent re A tremendous value on sale for $, the Sightmark Triple Duty 8.5-25x50 Riflescope delivers consistent results with modest features. The package contains the Sightmark SM13011 scope with 1/8 MOA adjustments and mil-dot reticle, flip-up lens caps (identical to Butler Creek products), a pair of lightweight 30mm tall stamped-aluminum scope rings, a small micro-fiber cleaning cloth, and a user guide with mil-dot scale.For recreational shooters this is the ideal scope for fixed known-distance targets: dial onto target and make ultra-fine adjustments. Both wind and elevation turrets offer 0 to 7-1/2 MOA per rotation in 1/8 increments, before a four-click (1/2 MOA) dead-space restart between the 7 and 0 marks. Absent a zero-stop, the dead space gap makes keeping track of turns past zero difficult and meaningless. It also makes the scope virtually impossible to record accurate elevation DOPE (data of previous engagement). I have a slip-on turret ring that fixes this for the second rotation, but Sightmark should have done it right the first time. Since I'm using this for a 600-yard F-Class rifle, it won't matter a bit.The included rings should work well on small caliber and semi-autos rifles, but I wouldn't trust them to resist sliding on bolt rifles of .243 caliber and larger. The rings aren't concentrically trued, so don't expect a perfect mating surface with the scope's tube. Further, the scopes has a 2.13 erector housing for the turrets, and popular AR-15 mounts like the Burris PEPR allow for 2.15 making for a snug fit. If you're shooting a 600-yard match, I recommend a 20-MOA base to create artificial elevation. If you're planning to go out to 1000, use a 40-MOA base. The scope offers 30-MOA up and down (60 total), but you'll get the best performance when the erector springs are near neutral loading at mechanical zero (not the same as point-of-impact rifle zero).The Sightmark 8.5-25x50 comes with a mil-dot reticle, using a fine center crosshair with four hollow dots equally distanced between subtension intervals. Included in the package is a mil-dot scale sticker, for determining the size of each dot in inches at various distances. Because this is a second focal plane scope, the reticle remains the same size at all magnification levels. The illumination has five levels of red and green for low-light shooting (but not for NVGs), and the center five mils of crosshair are lit. The ocular (reticle focus) adjustment is easily turned, and the parallax turret ranges from 10/20/50/100/200/700/infinity.The lens are clear, and surprisingly exhibit no signs of tunneling or CA on my product (ymmv). The end bell measures just over 55mm with my calipers, so finding a sun shade to screw in shouldn't be a problem (offered separately by Sightmark). On a sunny day the picture is bright at 25x, but on dark cloudy days it dims slightly. Overall, this scope gathers light well.Overall I rate this scope 75/100 compared to others of similar duty (but not price). Compared directly to others in an ever-changing $170-200 price point, it's among the best available. If allowed, I would rate it 3.75/5 stars.Pros: clear 25x magnification, repeatable adjustments, excellent valueCons: turrets are not good for rotating past zero, large erector turret housing, poor location for illumination dial.Similar scopes I own for comparison: Steiner 5-25x56, SWFA 5-20x50, Vortex Viper PST 6-24x50, Nightforce ATACR, Nikko Stirling Targetmaster 4-16x44. Disclosure: I paid for this product, and have no affiliation with any brand mentioned.